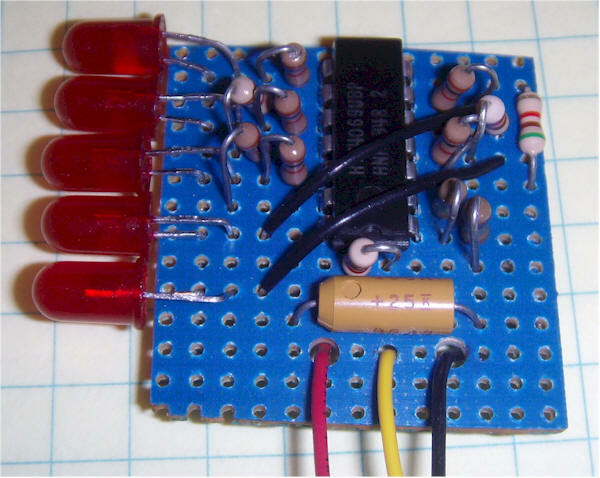 This simple bar graph display uses an ordinary CD4069UB hex inverter. Despite the limited number of LEDs, this display may be used for fine peaking and viewing small changes in amplitude because the brightness of the most significant LED varies with amplitude. As the voltage increases from zero, the first LED grows in brightness. Just when that LED is fully lit, the next LED begins to glow slightly. Each LED represents about 1 volt of change, when the circuit is operating from 9 volts. View a short Flash video to see the smooth transitions between LEDs. The transitions are even smoother than the video shows. The camera saturates a bit at full brightness, but the eye can still see the bright LED intensifying as the next LED begins to glow. The circuit will work at other voltages, but the LED resistor values may need to be adjusted proportionately.